Stride Rite - Pom-Pom Slippers, Baby Girls & Toddler Girls Dreamy quilted hearts are playfully finished with a plush pom-pom accent and soft faux-fur lining on these comfy slippers from Stride Rite. 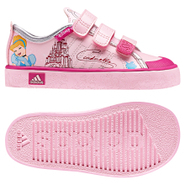 Adidas - Disney Princess Shoes She's too young for glass slippers but these adidas Disney Princess shoes come close with pretty Cinderella details galore. They feature a baby-friendly hook-and-loop closure a light and durable upper and soft EVA cushioning. First Impressions - Baby Girl Ballerina Slippers, Created for Macy's Keep her on her toes! These ultra-charming First Impressions ballerina shoes are a cherished favorite for all time.